Haiti has a long tradition of educating high quality nurses. However, in recent years the number of private nursing training institutions has increased substantially: there are now more than 400 private nursing school operating throughout the country. As a result of the growth in private institutions, little is known about the quality of education provided or the technical skills of their graduates. The public is therefore at risk of receiving questionable care and prospective nursing students have little objective information to help them select a private institution to attend. 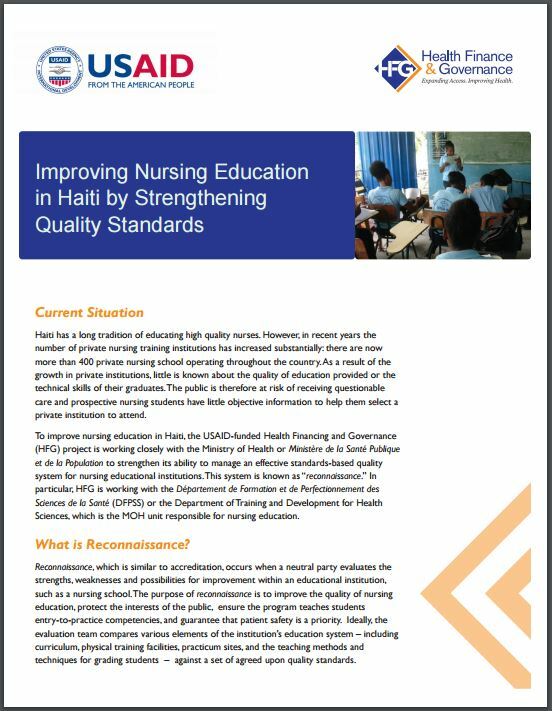 To improve nursing education in Haiti, the USAID-funded Health Financing and Governance (HFG) project is working closely with the Ministry of Health or Ministère de la Santé Publique et de la Population to strengthen its ability to manage an effective standards-based quality system for nursing educational institutions. This system is known as “reconnaissance.” In particular, HFG is working with the Département de Formation et de Perfectionnement des Sciences de la Santé (DFPSS) or the Department of Training and Development for Health Sciences, which is the MOH unit responsible for nursing education.